When you think of higher education institutions outside the United States, what comes to mind? If you’re from the U.S. yourself, you might have some assumptions worth questioning. Higher ed, like nearly every contemporary human endeavor, is globalizing. Lots of people have written about how national boundaries are eroding as more students spend more of their education not only on traditional international programs such as study abroad, but also online resources such as MOOCs that are, at least in theory, accessible throughout the world. One of the goals of my sabbatical semester was to get more exposure to higher education outside my own culture and national boundaries, and while this was only one among many things I’ve tried to accomplish, I feel I’m in a very different, better place than I was at the start of the year. I went about this aspect of my sabbatical in a non-traditional way (as I did for a lot of other aspects too, but that is a post for another time). I didn’t set up a formal residency or extended stint as a resident scholar, instead opting to visit different places on my own for a few days to a few weeks at a time. Partly this was for personal reasons, so that my spouse and I could synchronize the visit with the long spring break at my daughter’s school in Frankfurt. I found that with I could balance the family time and sightseeing fairly well with working remotely, while fitting in talks and university visits along the way. These included Goethe University, where I met with a group working in the area of faculty professional development and related fields, and the University of Malta, where I gave a pair of talks, one an extended workshop at the G.F. Abela Junior College and another more research-oriented session at the university’s College of Education. And then, as I was making my way through the EU, another opportunity came along: an invitation to travel to Beijing to participate in Tsinghua University’s Future Learning, Future Education conference and their annual Doctoral Student Forum. 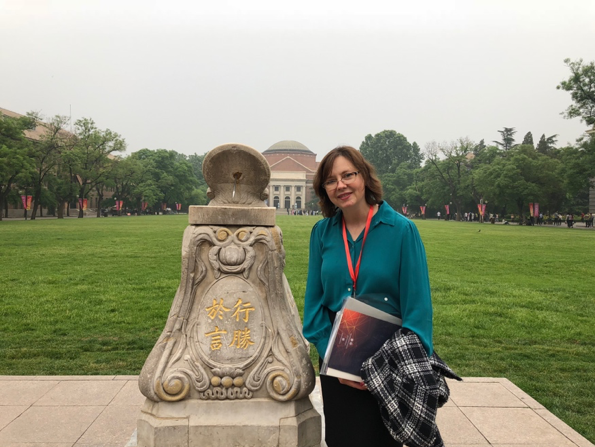 Getting the visa and travel set up was challenging, but we worked it out with the invaluable assistance of Tsinghua’s administrative staff, and so a few weeks after the other visits wrapped up I was headed to China. So what did I notice, from the point of view of someone whose work has unfolded almost entirely within the U.S.? I didn’t conduct a systematic cross-cultural comparison, and don’t want to imply that at all. But some things definitely stood out to me, including some that did make me take a hard look at assumptions I didn’t realize I had. I’ll start with the place where I spent the most time: Malta. This Mediterranean island nation is a place of tremendous contrast to the United States not only with respect to culture, but also raw geography: With a total square mileage only twice that of my little mountain town and a population of 436,000, life revolves around the reality of many people, little space. And just as its physical proportions are hard to fathom for somebody from the American West, the historical timeline is simply staggering, with structures dating back back to human prehistory and urban landscapes dominated by massive sheer walls built to repel pirates. Malta’s demographics skew a bit older than ours do, and I was surprised to hear that nevertheless younger people have a fair amount of political clout. The voting age was recently lowered to sixteen, which will probably have impacts on higher education. Malta has a longstanding policy of student stipends – cash in addition to free tuition – which seems likely to become even more politically popular now that younger teenagers have the vote. It’s a stark enough contrast to the United States’ dwindling public funding coupled with expanding private debt. But according to my hosts this policy may be having a mixed set of impacts on the academic investment of their students. Unintended consequences happen when you pay people to go to school, and nobody knows whether it will be economically sustainable or for how long. Even so, it gives a U.S. academic pause to think of what we could do with even a fraction of that kind of investment. Compared to Malta, Goethe seemed like familiar territory, not surprising given that our system of universities was modeled partly on Germany’s. Goethe was established in 1914 with a combination of private and public funding, and supports a mission of research and teaching, with over 45,000 students and an impressive portfolio of external funding – again, a familiar balance to those of us in the United States. Serving that combined research-teaching mission means, as it does here, that there needs to be a robust faculty professional development system, and that is what we spent most of our time talking about in the presentation and lunch I attended. There, as here, college teachers often enter the profession without much, or any, specific training in pedagogy or learning science. I was impressed to learn about their multi-staged, in-depth development program for faculty. Informed by their core group’s expertise in fields such as service learning, e-learning, and the role of emotions in teaching, this program offered a structured way for faculty to develop, document, and receive recognition for their teaching expertise. That brings me to the experience of visiting Tsinghua. This university was founded in 1911 and in its early years concentrated on engineering and polytechnic education, later evolving into a selective, internationally oriented research-intensive university. Tsinghua’s location in Beijing also puts it in proximity with a number of other colleges and universities, creating a rich network of colleagues and collaborations that were a big part of the Future Education, Future Learning conference and the Doctoral Student Forum. But I still got an intriguing first look, especially at how both fully online learning and technology to enhance face to face courses are taking off. One of the papers I judged as a panelist, for example, presented experimental findings demonstrating the effectiveness of a newly developed mobile application for botany instruction in seventh-graders, including some interesting interactions between features of the app and student self-efficacy. Another standout was the roundtable session kicked off by short presentations by Schwarzman Scholars working on projects in global issues in education; these ranged from the impacts of summer bridge programs to how school leadership affects culturally responsive education in high schools around the world. Brand-new to me was Rain Classroom, an app I heard a lot about while I was there. Rain is a mobile technology for in-class quizzing, participation, and materials sharing that students activate by scanning a QR code when they come in to class. It combines some of the features of the student response systems we’ve come to know in the U.S. with features of social media. Most notably, professors’ slide decks disappear after a set time, à la Snapchat, something that makes the prospect of sharing more palatable to many. These were the new, surprising, and noticeable things for me, a visitor coming in from a relatively limited perspective. But even more salient were the issues that people mentioned over and over, across so many completely different places, including many of the same things that I hear about at all kinds of institutions here in the U.S. In the end, that’s another assumption I didn’t realize I had – that students, and faculty, and the problems we face, must necessarily be different or even unrecognizable compared across national boundaries. Now I think there are some really similar themes, ones I think are thought-provoking. I’ll talk about them in Part 2, coming soon.